It was another hot day (about 100) when I drove back into downtown Little Rock. I ended up getting a few shots of some places while trying to test out some stuff on the camera. The first stop was along Second Street, by the Pulaski Country Courthouse. The heat of the day had been chased away by a huge storm. Distant bolts of lightning were being reflected on the side of the Stephens Building. There is a small park by the courthouse, with this old fountain. In the background is the Robinson Center Music Hall. From there I drove over to the state capitol in hopes of catching some pictures of the lightning. I had been there for a few minutes when a Little Rock police officer walked up to me. "Great..." I thought, figuring that I was about to get arrested for taking pictures of the capitol or some such nonsense. But the officer said "hey buddy!" and introduced himself. He had walked up with a camera on a tripod, and he was also out trying to get pictures of the lightning. Turns out that he is new to photography and wanted to talk about it. I did refrain myself from using any bad puns ("it would be criminal to not be out taking pictures tonight"), but I didn't end up with any pictures of the lightning. Perhaps the best invention by mankind has to be air-conditioning. I can't imagine what it was like to have lived in this part of the country back when you relied on fans to battle 100 degree weather. Actually, I take that back, I do kinda know. I spent about half of last summer driving a car with a broken air conditioner. But AC is amazing, there might not be a better moment of bliss as the one you encounter when walking into the cold embrace of an air conditioned building after being in the thick humid Arkansas summer. It was about 98 degrees outside when I drove into downtown Little Rock to meet up with John for a few pictures. We decided to brave the heat for a few shots, and headed over to Riverfront Park in North Little Rock. 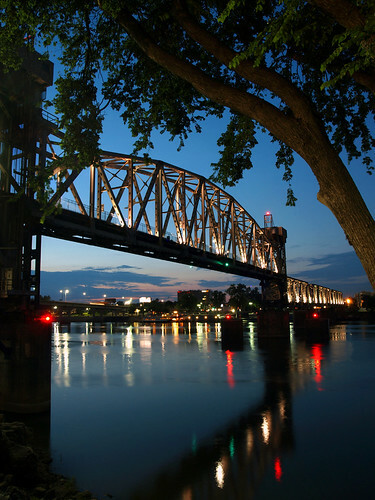 We set up under the I-30 bridge, which provides a good view of the Little Rock skyline and the Junction Bridge. We weren't the only ones who headed out there, a guy drove up and pulled a tackle box and fishing pole out of his truck. Dressed still in his work uniform, he told us that a bass was waiting for him. He quickly went down the rocks to the river and started fishing. He did end up catching a decent-sized fish, but ended up releasing it back into the murky waters of the river. For being so hot and humid during the day, it was actually pleasant along the river. There was a nice breeze rolling through. Here is one last shot, taken after dusk.. I really wish I was able to fill this space with pictures I took at this year's World Cup - but that's not really possible. Travel to South Africa is well beyond my means, and my passport has expired anyways. I've been a soccer (sorry football) fan for many years now - the first professional soccer game I attended was way back in March of 2000 (Dallas Burn vs. Chicago Fire). The World Cup is the largest sporting event in the world, like the Super Bowl and Olympics combined and then multiplied. I probably won't be able to attend a World Cup game until the USA gets a chance to host them again (and we're trying, with bids for either 2018 or 2022). The US National Team had its first game of the 2010 World Cup today, drawing England 1-1. We were lucky to get the draw, thanks to a huge gaffe by the English goal keeper. It wasn't perfect, but we'll take it. Donovan is perhaps the best US player. He currently plays for MLS' L.A. Galaxy. This was taken during a game last year between L.A. and the Kansas City Wizards. Donovan has scored the most goals by an American in international competitions, with 42 goals. He has been part of three MLS Cup winning teams, and played with L.A. in last year's MLS Cup, when they lost to Salt Lake. 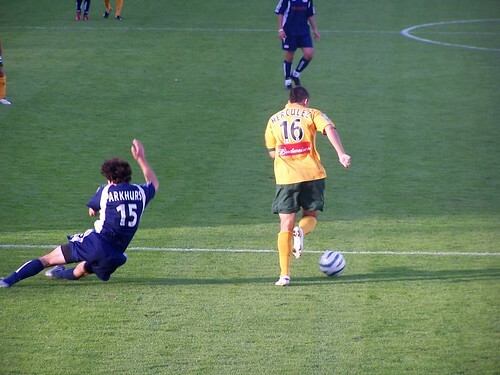 Also in this shot is David Beckham, who at the time was trying to get back onto the England World Cup squad. A bad injury kept him out of the Cup, but he was spotted sitting next to England's coach in today's game. 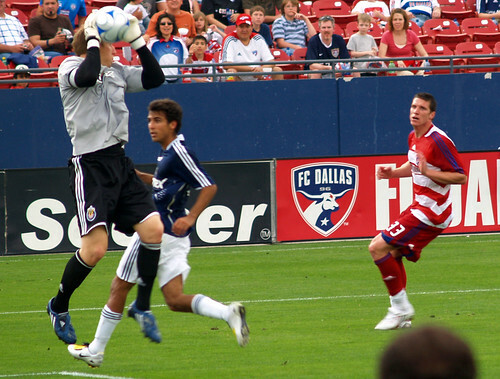 Goalkeeper Brad Guzan, during a game in 2008 between FC Dallas and Chivas USA. Guzan was the Chivas USA keeper, but moved to play keeper for English club Aston Villa, also in 2008. Guzan is good, but probably won't see much playing time in this World Cup unless there is a serious injury to starting US keeper Tim Howard. 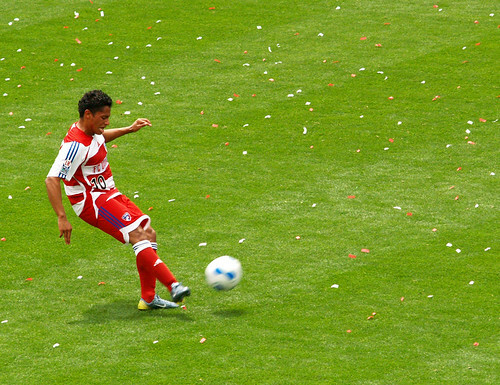 Seen in the far right of this shot (in blue), during the game in 2008 between FC Dallas and Chivas USA. Bornstein is a defender, but he has scored two goals in international competitions of the US National Team. One of those goals came last year, in the final World Cup qualifier against Costa Rica. His goal, in the final few minutes of the game, would prevent Costa Rica from making an appearance in the World Cup. When Costa Rica drew against the United States, it meant that Honduras automatically qualified for the World Cup. There are reports of people in Honduras chanting Bornstein's name during their nationwide celebrations. This is a shot of Herculez Gomez, back during the 2005 MLS Cup. Gomez then played for the L.A. Galaxy, but ended up getting traded to the Colorado Rapids in 2007, and the Kansas City Wizards in 2008. Earlier this year he ended up going to the Mexican team Pachuca. There he scored ten goals, which tied him as the top goal scorer in the Mexican first division. That is the first time ever an American has been the top goal scorer in a foreign league. Based on that performance, he was called up to the national team, where he scored two goals in games against the Czech Republic and Australia. 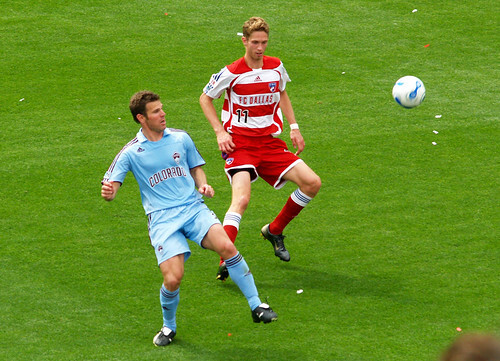 On the left, when he played for New England at the 2006 MLS Cup. Dempsey played in MLS for three years, before heading over to Fulham, in the English Premier League. Dempsey has 19 goals in international competitions for the US National Team, which includes his goal earlier today against England. Goodson, here on the right in the red and white hooped FC Dallas jersey. After being selected as a first-round draft pick in 2004, Goodson played several years for my club team, FC Dallas (and scored 3 goals). He left in 2008 to play defense for IK Start in Norway, where he has scored 7 goals. Goodson has played 14 games for the US National Team, and has scored 2 goals (so far). Ramon Nunez was born in Honduras but grew up in Dallas. He was drafted in 2004 by the Dallas Burn (later FC Dallas) during the MLS SuperDraft. He played for Dallas from 2004 to 2007, where he scored 14 goals. He would end up being traded to another MLS team in 2007, and then ended up going to play in Honduras in 2008. He is part of the Honduras National Team, where he scored three goals during their qualifications for the 2010 World Cup. I have some photos of other MLS players who were considered for the final World Cup squad, but didn't make the cut. I won't bother you with those, even if they include some of my favorite FC Dallas players like Jeff Cunningham, Dax McCarty and Heath Pearce. But the USA will continue on, playing Slovenia on June 18 and Algeria on June 23. 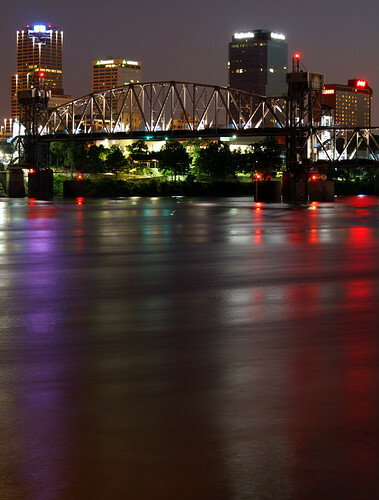 The city of Little Rock just finished working on the area at the foot of the Junction Bridge, in Riverfront Park. Their optimistic plan was to dig out some of the dirt around the bridge, and hopefully expose more of the "little rock" there. 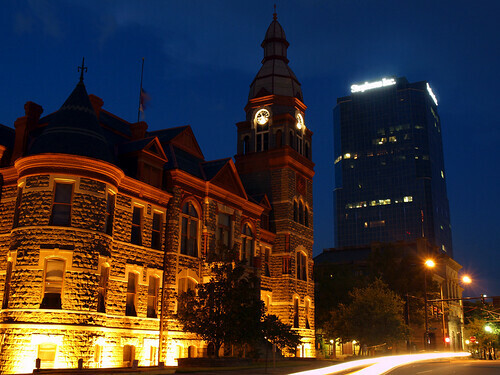 That chunk of sandstone gave the city its name, but it had been neglected and ignored over the past century or so. The rock was a major landmark in the early exploration up the Arkansas River. But in 1872, the city of Little Rock allowed most of the "little rock" to be blasted away, in order to serve as the base for a bridge. 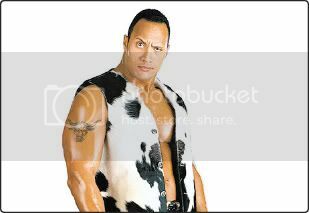 The poor "little rock" was cut, but of course, problems arose and that bridge was never finished. About ten years later, the Junction Bridge was proposed. More of the rock was taken out, and unceremoniously dumped in the river. The Junction Bridge itself was completed in 1884. What I don't get is why they needed to put the bridge there in the first place. Three other bridges were built over the River around the same time period (the Baring Cross, the Rock Island and the Free Bridge). The first Baring Cross Bridge was built before the Junction Bridge, yet somehow they managed to construct it without needing to set it atop a small bluff. But that's old history now - all water under the bridge, so to speak. But Monday night I drove downtown and walked by the bridge to see just how much of the rock is still there. 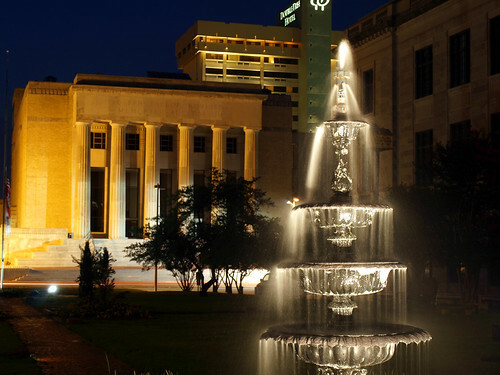 There isn't much of the "little rock" that the city was able to find, most of it has been lost to history. So the city went with Plan B, and constructed a nice little plaza area around the base of the bridge. 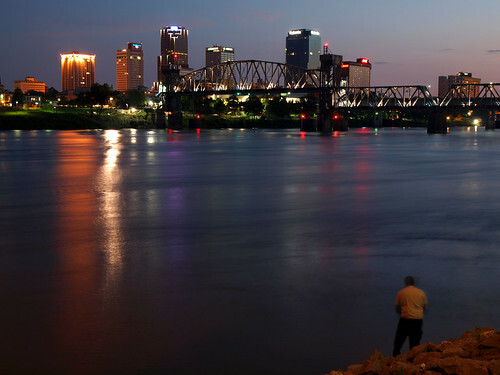 There are little signs giving the history of the "little rock," the history of the city and of the bridge. All are attached to sandstone boulders, which is a nice touch. The plaza also opened up a lot more places to view and get pictures of the bridge, which I'm happy about. 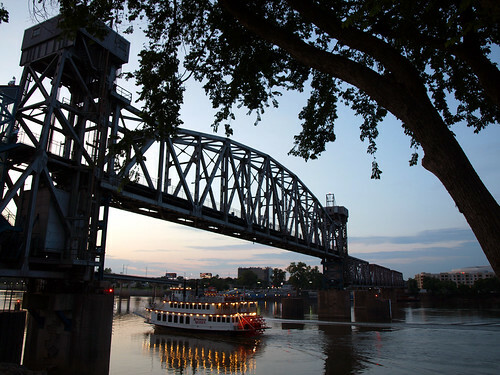 This is a view of the bridge, with the Arkansas Queen riverboat passing underneath. Oak Grove is a small community in Pulaski County, located west of North Little Rock and stuck between the freeway and Camp Robinson. I drove through there a few months ago, on a random search for something interesting to get a picture of. I found one spot, an old gas station. I didn't have the camera with me, so I set it aside for a day when I had some free time to head back out there. I made the short drive over there yesterday, and found the gas station again. It's old and abandoned, but does feature a leather recliner that overlooks the passing traffic of Hwy. 165. You can tell the station has been shut down for awhile now. 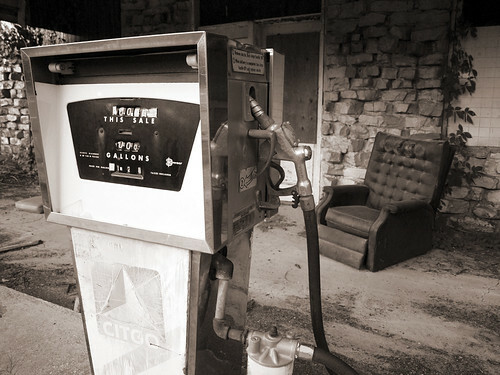 The old relic of a pump still shows how expensive gas was the last time it went into service - a bargain at $1.22 a gallon.